Should I feel confident with no makeup on? Sure. Do I? Meh. Maybe if I have glasses on and half of my face is covered. I don't hate the way I look without makeup on but I definitely feel more confident with a little help from my cosmetic friends. I have had dark circles under my eyes for as long as I can remember (having allergies my entire life means I have rubbed my eyes a lot over the years) and I have light eye lashes. So I feel my best with a little bit of concealer, mascara and blush for good measure. Even before becoming a mom I didn't have the patience for a full face of makeup every day. Actually, before becoming a mom I had less time to put on makeup because I would literally roll out of bed 15 minutes before I had to leave for work. 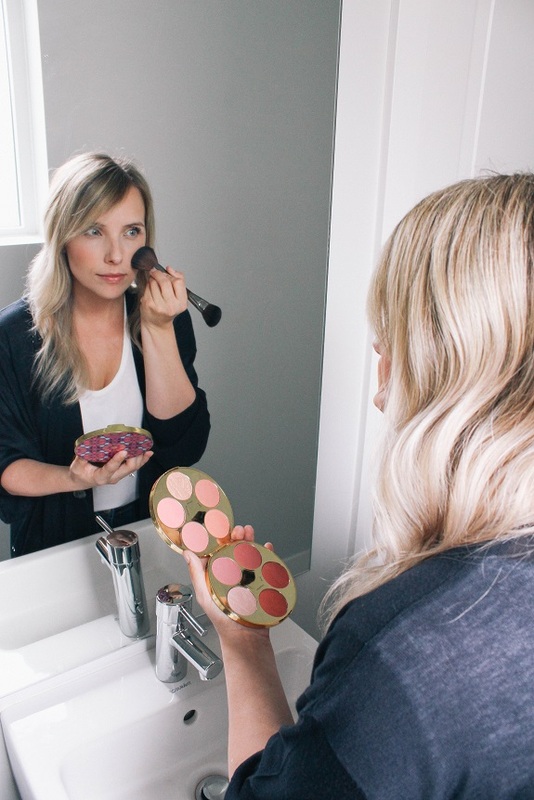 I just showed you my updated skincare routine so I thought I would show you my updated every day makeup look and favourite products! I love trying new makeup (such an expensive hobby) but I've been using this concealer combo and mascara for 5 months now. This blush palette is new-ish and while I like it so far I have yet to find my ride or die blush. 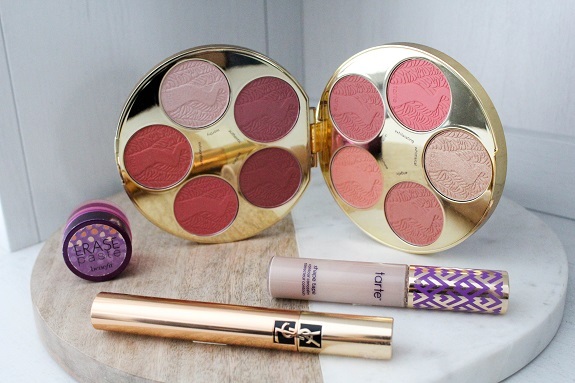 Tarte Limited-Edition Blush Bazaar Amazonian Clay Blush Palette - I'm not particularly loyal to one brand of blush. I have been having a really tough time finding a blush I love so I decided to try this palette. What I am really loving about it is that there are a variety of colours and I can usually find a colour that goes with every makeup look. Tarte Shape Tape (in light) - It's a little drying on my super dry skin but on top of a creamy colour corrector it's amaaaaaazing and easily the best concealer at covering dark circles that I've ever tried. YSL Volume Effet Mascara - My new favourite mascara. It's long lasting and creates the most gorgeous fluffy eye lashes. Benefit Erase Paste (in medium) - OH MY GOSH, IT'S BEEN DISCONTINUED. EVERYONE PANIC. Juuuust kidding. Well, I'm only half kidding. Technically it has been discontinued but please don't panic. After a trip to Sephora and some very helpful gals I have hope again. Benefit rebranded the Erase Paste into their Bo-ing Concealer range as the Brightening concealer. I was told nothing had changed but read reviews that it was a little more drying. They gave me a sample and so far it seems pretty similar so all is not lost. 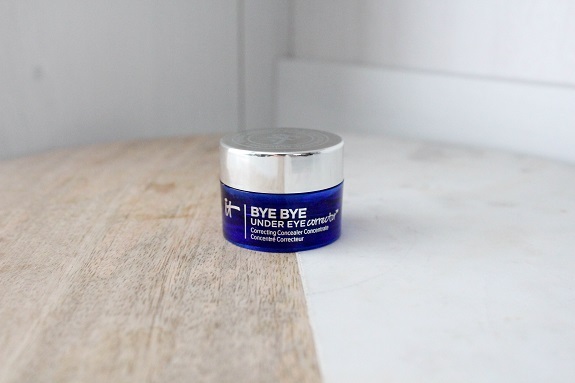 I also read some great reviews about the IT Cosmetics Bye Bye Under Eye Corrector so I decided to give it a try in the colour light. I've used it a couple times and I'm happy to report I really like it. It doesn't have the pinky tinge the Benefit corrector has so I wasn't sure how it would perform but it's nice and creamy so it pairs well with the Shape Tape. I also liked the coverage on my dark under eyes. What is your current every day makeup routine? If you have any products you can't live without I'd love to hear what they are!